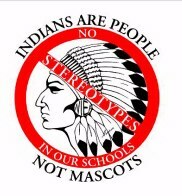 It is imperative that schools teach respect for America=s indigenous cultures by removing stereotypes in the form of ‘Indian’ mascots, logos, and nicknames. If we are to have any meaningful dialogue about eliminating racism in our society, we must first stop teaching this form of overt racism in our Nation=s education facilities. Any high school with an ‘INDIAN’ logo is teaching a course in hands-on racism. It is teaching students how to stereotype a group of people on the basis of race, religion, ancestry and cultural ethnicity. It is teaching students to maintain these stereotypes and to promote them by carrying them into other school districts at interscholastic sports competitions. The WIEA Taskforce wants all children to receive a high quality education that prepares them for the challenges of adulthood. We want all children to learn accurate and authentic historical and contemporary information about their own cultures and those of other people. We want all children to fully participate in the educational process in our schools, and we oppose all barriers to learning that create an intimidating or offensive school environment for any child. Stereotypical images of American Indians interfere with learning by creating, supporting and maintaining oversimplified, and inaccurate views of indigenous peoples and their cultures. Along with other societal abuses and stereotypes, Indian mascots and logos separate, marginalize, confuse, intimidate and harm American Indian children, thereby creating a barrier to learning and making the school an inhospitable place. Schools must be places where children are allowed equal opportunity to participate in learning. The use of ‘INDIAN’@ logo caricatures denies full and welcome participation to American Indian children, while at the same time teaching all school children to tolerate discrimination against Indian people, their heritage and cultures. Regardless of original intent, relative attractiveness, or degree of cherished attachment, an ‘INDIAN’ logo and the school traditions that grow up around it present harmful stereotypes of living people and living cultures to students in the school environment. ‘INDIAN’ logos do not honor Indian people; these logos are nothing more than outmoded, culturally demeaning symbols of oppression. Icons of discrimination, including ‘INDIAN’ logos are slowly and surely following Sambo=s restaurants and blackface minstrel shows into the realm of cultural oblivion. At question is not whether ‘INDIAN’ mascots and logos will be removed from school settings across the nation, but when and how. Rising awareness that these archaic symbols are teaching children how to do racism is resulting in the removal of ‘INDIAN’ logos in elementary and secondary schools, colleges and universities throughout the nation. In October of last year, the Los Angeles School District, the second largest in the nation, banned the use of Indian mascots and logos. In May of this year, the Dallas Public Schools followed LA=s lead. In recent years the State of Minnesota has decreased Indian logos in its public schools by over 80%. In national forums such as the Conference for the Elimination of Racist Mascots, the National Congress of American Indians Semi-Annual Meeting, and the National Indian Education Association Conference, Indian people and their allies are asking that schools eliminate ‘INDIAN’ mascots and logos by the year 2000 so that Indian people can enter the next millennium without this form of racism doing damage to our children and our culture. Finally, one particular image, the characterization of a Plains Indian religious leader is insulting because it is being associated, not with a religious place or ceremony, but with a sporting event - as part of a game. Not only does it misrepresent and trivialize American Indian religions, but depicting an equivalent religious leader from another culture: an Archbishop, Minister, Rabbi, the Dali Llama, or the Pope would be unthinkable. Such an icon would not be tolerated both because it insults our religious sensibility, that sense of reverence that informs our behavior when in the presence of the sacred, and because it promotes a particular religion in a public school setting. For the benefit of all our children, we hope you will join the effort to eliminate racism in the form of ‘INDIAN’ mascots and logos from the public schools. It is not conscionable that public schools be the vehicle of institutional racism.